If I'm 100% honest, my reaction to discovering Beryl of Cinemon Girl had picked the Toasted-Coconut Custard Tart was a groan. I'm not the hugest fan of coconut but really I was picturing hubby's reaction to learning his weekly TWD dessert contained two of his least favourite things, being coconut and rum! After careful consideration of the recipe (and in light of our newly upheld participation requirements) I decided I would make the smallest possible version, just 1/6th of the recipe. My plans went astray though when I made the full batch of sweet tart dough and automatically pressed it into a 9 inch pan. I figured the universe had spoken so went ahead and made the full recipe hoping I wouldn't have to eat it all myself or worse, throw 90% of it away. Well, this recipe has been one of the biggest surprises of TWD so far. I actually liked it. To the point of eating spoonful after spoonful of the coconut custard from the fridge while it was supposed to be cooling. Sweetened shredded coconut is pretty hard to find in Australia. There is one brand that I know of but it contains all kinds of nasties so I went with good-old dessicated coconut which you can find in every supermarket here. This may have changed the texture of the custard quite a bit because after cooling in the fridge it had the consistency of cold porridge. Blech. But still tasty! I used just 1 tablespoon of rum in the custard and that was plenty. I also left the rum out of the whipped cream topping and sprinkled the top with fresh lime zest. Fabulous! I did find it very sweet though the lime zest on top really lifted it. The coconut and rum flavours weren't overpowering and of course the sweet tart pastry was brilliant as always. I think next time I would add even more lime by making a lime and coconut custard. The fact I'm already thinking about next time is amazing! I was able to give a lot of it away and it got a positive reaction from everyone. Guess that makes it a winner! A big thank you to Beryl for picking this tart, because I would never have made it on my own! You can find the recipe on Cinemon Girl. I love it when I'm pleasantly surprised by a Dorie recipe, and I am so glad that you were this time round. 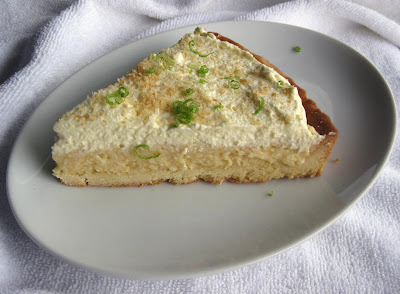 Love the lime on top - your tart looks amazing. It looks fabulous! Im glad you liked the recipe! We loved it! You sound like me...I kept stirring the custard just to be able to have "just one more" spoonful! :D Looks great with the lime. Beautiful tart! I love the addition of the lime. Isn't it nice when something surprised you like that. Looks refreshing with the zest on top.